'Redneck' arrived a month ago redefining the vampire genre by not giving into convention or cliché. In fact, if you've read the first two issues, the vampire angle serves more as subtext than its selling point. It's the perfect approach to this character-driven southern fried drama that simmers with tension and intrigue. The Bowman's way of life just got upended and what was once a peaceful and secluded existence is on the verge of war. The vampires of Texas keep to themselves, raise their cattle, drink its blood and sell the meat through their BBQ joint. Seems like a brilliant front to keep them in the shadows while staking out a living. All that is threatened when one of their own is killed after a night on the town. This issues fills in the holes to what might have happened and what the hell is going on in town. However, JV's got the younger Bowmans locked down in the basement to make sure they don't go off and do something stupid. Revenge might be necessary but not before they know exactly what's going on. Donny Cates is weaving a very intricate tale relying on his characters' backstory, their current motivations and impending conflicts. Once again, Cates puts in the work to flesh out this world instead of taking the easy route and exploiting the vampire mythos. It's restrained compared to Cates other Image Comics title God Country, where a man is imbued with the power of a god and must fight the gods to keep his power. It's a rock concert where Redneck is a dramatic symphony that is ready to crescendo. It's the reason Cates is a rapidly rising star in the comics biz. His versatility and imaginative stories are page-turners. Lisandro Estherren is paired perfectly with this southern gothic providing heavy lines and shadows that is in sync with the ominous tone. The art style is ragged and sketchy but serves this dark tale well. Dee Cunniffe keeps the colors washed out and earthy giving it and the Texas setting a grounded western feel. 'Redneck' #2 is the precursor of deadly things to come. Cates sets his marvelous characters in motion that will surely erupt in an explosive clash. 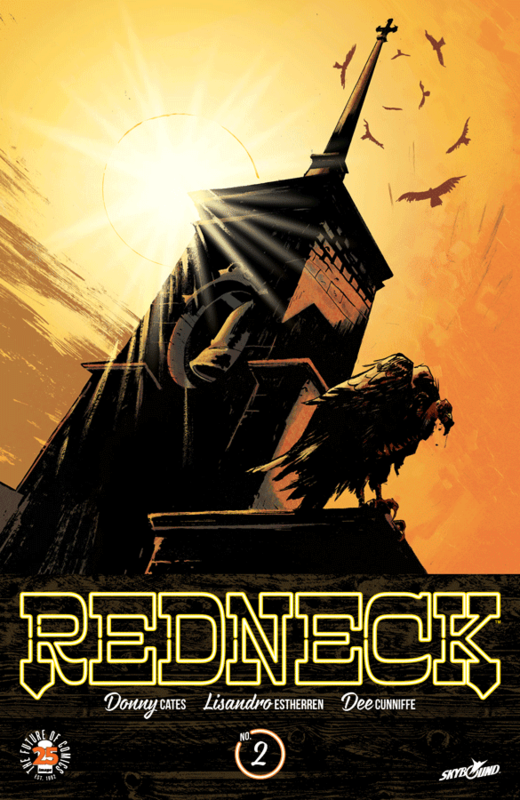 If you're a fan of Southern Bastards (and you should be) and want a twist of horror unlike any other then 'Redneck' is for you. There are few must-reads in comics and this is definitely one of them.